A seriously pro instrument for professionally minded players. The single-coil sounds alone are well worth further investigation. Classic looks with pro-style appointments. No loss of volume between single-coils and humbucker. Great classic rock and modern blues tones. Excellent build. Up until 2006, Suhr was strictly a custom shop, but as demand increased the 'Pro' series was devised, and featured the most requested custom configurations, including stainless steel frets, a compound radius fingerboard and locking tuners. Nine years on, and with five different body styles on offer, the Pro series now represents a healthy proportion of the USA company's output. Every aspect of the Classic Pro appears to be a compromise between classic vintage-style and the requirements of the modern or 'pro' player. For example, instead of the thin and typically ding-prone nitro finish, or the thick polyester finishes found on so many modern guitars, a 'thin skin' polyurethane coat provides a middle ground - perhaps to cater players who want a hard-wearing guitar but also the tone-impacting 'wood resonance' associated with a nitro finish. "All Suhr's guitars benefit from an in-house Plek setup before shipping. Consequently, the guitar feels near-perfect"
Then there's the body shape: the Fender classic double-cut shape influence is obvious, but closer inspection reveals many modern concessions such as the chamfered lower horn and neatly tapered neck block, designed to enable comfortable left-hand positions higher up the neck. A similar neck block chamfer is a feature found on Fender's Custom Shop Closet Classic Strat Pro, a guitar also designed to accommodate the most popular 'modern tweaks' requested on custom orders. An obviously modern appointment is found on the headstock with Suhr-branded locking tuners. In our experience, locking tuners can prove invaluable to any gigging guitarist, especially if you change strings before each gig; they at least halve the time you would normally spend winding strings and offer better tuning stability, especially if a vibrato is involved. Unlike some other-branded locking tuners, their manual locking parts are thoughtfully designed with an appropriate amount of girth preventing their imprint from being permanently carved into your precious fingers when tightening or loosening. The two-point Gotoh 510 is frequently present on Suhr's vibrato-equipped guitars and proves a very stable system. Again, a two-point rather than six-point vibrato is a victory for the modernists, but as a gesture to vintage fans we have bent steel saddles and a vintage-spec heavy steel block, which carries tangible sonic benefits over many cast alloy materials in the form of increased sustain and clarity. Although pretty much any neck dimensions can be spec'd when ordering a custom model, Suhr actually offers quite a number of its own designs. Here we have what Suhr dubs an "even C medium" neck profile, which, from the profiles offered, sits as a perfect compromise (that word again) between the thinner 'elliptical' carves usually found on the Modern Pro series, and the bigger, rounder 60s-influenced profiles often requested by fans of thicker necks. It's a very comfortable palm-filler and expertly rolled fret edges ensure a pleasurable playing experience for anything from soulful blues to quick legato lines. The increasing girth towards the higher end of the neck may not be to the taste of the modern day 'shredder', but those kinds of players may be more suited to Suhr's Modern Pro series. All Suhr's guitars benefit from an in-house Plek setup before shipping. Consequently, the guitar feels near-perfect with the tall and expertly crowned stainless-steel frets providing a bright, snappy acoustic tone and a smooth action when string-bending. "There is no perceived dip in volume when switching, with little compromise to the tonal identity of each pickup position"
As for sounds, at the middle and neck position is Suhr's V70: a pickup that pays homage to 70s-era rock single-coil sounds. Playing the Pro through the dirty channel of a Cornford MK50 II, we couldn't help but bash through some Ritchie Blackmore-style riffs. Classic rock isn't the only genre on the menu, though. With the volume slightly rolled back you can pull off some authentic bluesy SRV-style tones from the neck pickup, and with the overdrive disengaged, welcoming glassy, shimmering cleans are the order of the day. Despite the extra power required for those rock tones, these are very quiet single coils thanks to Suhr's passive SSCII (silent single coil) noise cancelling system: vintage sounds without the vintage hum. The SSV bridge humbucker is characterful, too, and has plenty of output for any classic rock amp setting thrown at it, although it's a little underpowered for the modern rock player without help from a pedal or two. A very common problem for guitarists who use humbuckers with single coils is achieving a good balance in volume when switching between the two. Careful attention seems to have been given to this quandary as there is no perceived dip in volume when switching between the five positions, with little compromise being made to the tonal identity of each pickup position. Very versatile indeed, and invaluable to a busy live or studio player. The Suhr Pro seems to be aimed at pros, or at least those who need those 'extras' not always supplied with a more standard guitar of this type, such as increased contouring, a compound radius fingerboard and the detail 'boutique quality' construction that's associated with high-end brands such as Tom Anderson, Tyler, Vigier and many more. 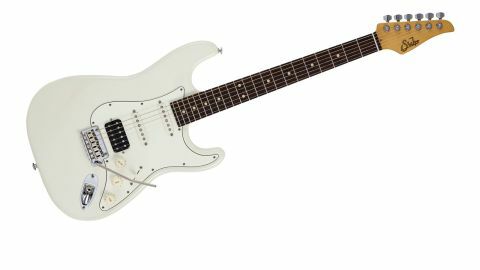 The 'boutique' double-cut bolt-on market is, of course, highly saturated and the Pro faces some serious competition, not least from the similarly priced and spec'd Fender Deluxe Strat. Both are very similar, but the thoughtful design and customised feel of the Pro could well swing the decision in Suhr's favour. Admittedly, it's not a guitar that immediately sets the pulse racing - the hot-rodded S-type market has been with us for many a decade - but make no mistake, this is a thoroughbred. It's also a very authentic taste of Suhr's custom models and as an owner of a well-gigged custom Suhr, this writer can attest that there's very little difference between the two.